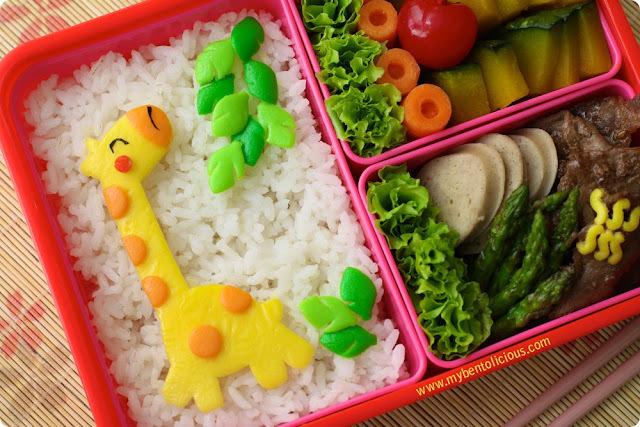 This giraffe bento was copied from kid's coloring book that I about to throw away when I was cleaning up the kids' bookshelf. I made the lettuce 'green' baran for this bento, hope this counted for B.O.M.B challenge. Just pretend that the box didn't have any separator and the only separator is the lettuce ;) I was cleaning up the last veggies and meats from the refrigerator. Not many foods left so this bento didn't get so much colors. Inside the box : Steamed kabocha with honey, baby carrots, sweetened red cherry, slices of chicken sausage, and thin slices beef & asparagus cooked with Korean BBQ sauce. You can read how to cook Kabocha at Debra's blog - Hapa Bento. Happy Friday!! Did you use egg sheet for all of them? I love love love how cute the giraffe and leaves are! Soo talented! Oh Lia, this is so cute!!! I love the giraffe and all of the leaves! Absolutely sweet and beautiful! for a 'cleaning' bento, very colorful and cute! Lia, I really love all your Bento creations, you really did a GREAT GREAT job! Super cute giraffe and I love how you did the leafs in two different tones of green. Lots of love !! The rest of the contents sounds delicious also. Yummy way to end the week. Hahaa...looks like the giraffe is enjoying eating the leaves on the tree. So creative! @Anncoo : Yes, the little giraffe is having his lunch too hehehe ... Thanks a lot Ann! *singing* pretty pretty tally giraffey *hahaha ngawur* would you like to be my lunch??? @tatabonita : *giraffe run away* hahaha ... Thanks a lot Tata! Your comment is always so fun to read :) The dots and the leaves were also made of egg sheet. Only add a little bit of corn starch and water and mixed it with egg. Try it and have some fun! I like your bento! The box itself adds a lot of color. Your giraffe is adorable! Nice job! Aw, this giraffe is soooo cute! Love it! And the leafs look gorgeous! So great colors ^-^ Really well done. Very Cute! What are those yellow things at the right hand side? Lia, i want to call you sifu already, would you take me as your student, please? ^. * Those colourful egg sheets area really inspire me. I am totally loving it. My princess told me"those leaves down there were too low, giraffe can't reach them." I said "How about you help to pick it up and feed him?" she reply "Yes!Yes!Yes! I want to feed giraffe"..hahaha..
Amazing giraffe!! How did you get it to look "bumpy"? It looks almost like puffy paint! Childrens' books are a wonderful inspiration and lovely leafy baran rosettes! I love your giraffe!! He's sooo cute! My son loves giraffes too! May I know how u cut this giraffe? Free-hand or cutter? I don't understand how you can be so precise with egg sheets, this looks wonderful! Everyone said it best! I offer a huge ovation for one of the cutest bentos I've ever seen. So cool. Thank you for sharing your talent. @Angeleyes : Thanks a lot! so cute, this giraffe really caught my eye. well done.